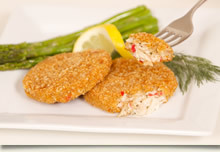 In keeping with and old family recipe, we select the finest blue crab meat available and blend it with fresh bell peppers, onions and crispy toasted crumbs. We then season it with our secret blend of the finest spices and hand stuff into a natural crab shell. 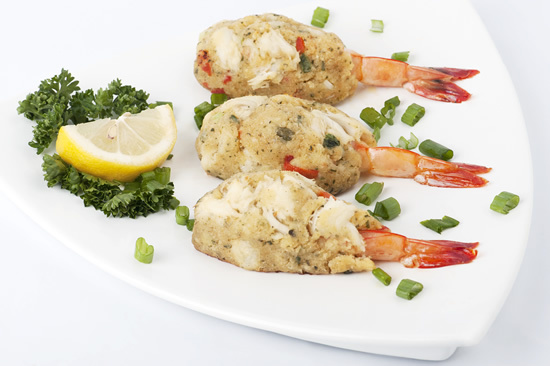 A variety of sweet shrimp stuffed with our family’s blue crab stuffing. 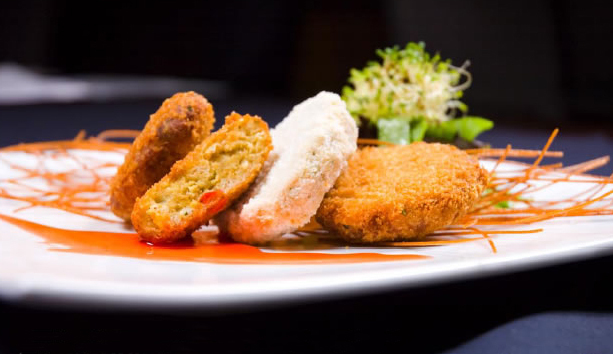 It is perfect for appetizers, entrées and buffets. 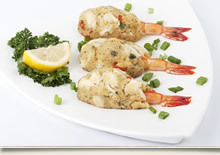 The stuffed shrimp are available in .87 oz., 1.5 oz. and 2 oz.. These products are fry or bake. 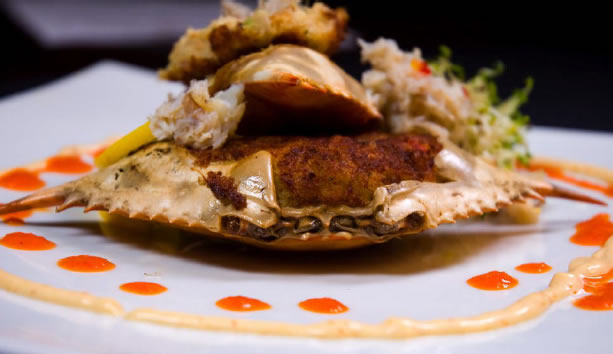 This crab cake is priced to sell on an “all you can eat” buffet, in a concierge lounge, a “kid’s” menu or any format in which a product is desired for cost minded individuals. 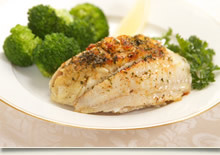 Available in 1 oz.., 1.5 oz.. and 2 oz.. portions. This product is fry only. 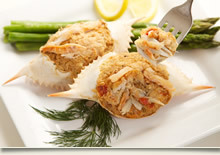 The Gourmet Supreme stuffed crab has been formulated for the most discrete customers who demand only the very best. 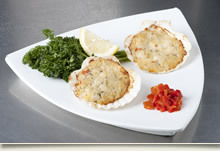 We blend a very generous amount of handpicked blue crabmeat with crispy toasted breadcrumbs and a blend of vegetables. We then season it with our family’s tastiest spices, and then bind it with mayonnaise and ultra pasteurized eggs. 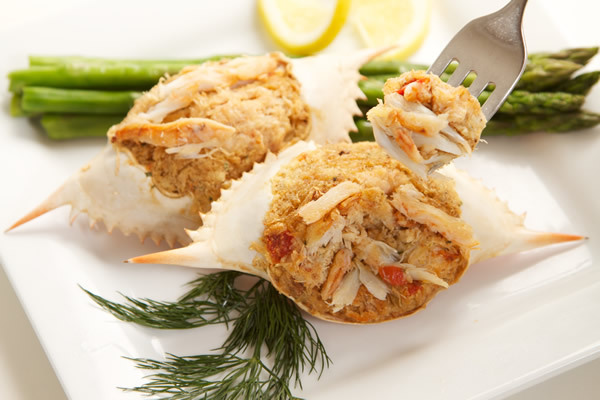 This delectable goodness is hand-stuffed in a sanitized natural blue crab shell and is available in 3 oz. and 4 oz. portions. This product cannot be matched for quality! We recommend baking, but it may also be deep fried. Available in 1 oz., 2 oz., and 3 oz. 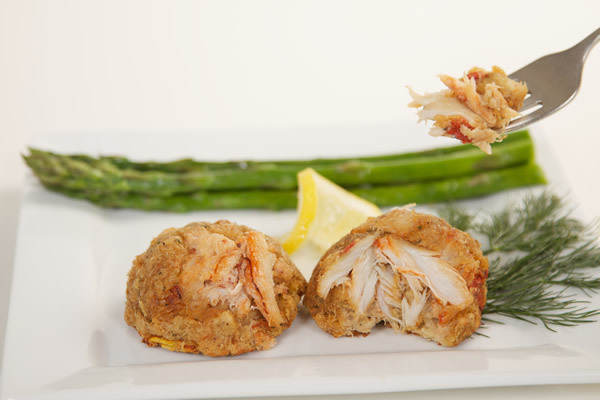 portions, the Maryland style crab cake has been formulated for those discreet customers who demand only the very best in a classic handpicked claw crab cake. It can be served on a bun, as an appetizer, or as a meal. For best results, we recommend the product be sautéed, but it can also be deep-fried or baked. 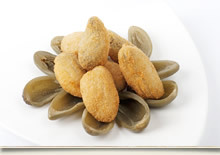 Available in three ounce portions, this product can only be fried, and can be served anywhere because of its ease of preparation. The 3oz. 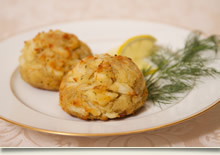 Seafood Crab Cake is priced just right for the economy minded consumer. It is combined with toasted breadcrumbs, onions, red bell peppers, and imitation crabmeat. This product can be sold to any restaurant. 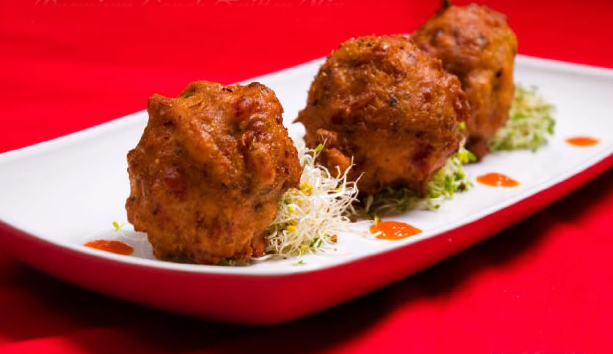 It can be served on a bun, as an appetizer, entrée or combined with any seafood platter. It is also great for children or kids meal applications. 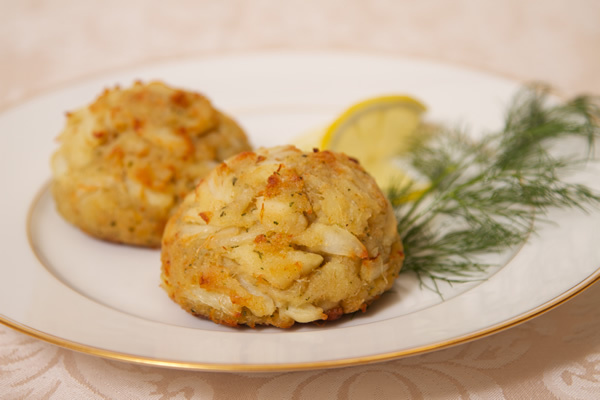 Our supreme jumbo lump Crab Cake recipe has been handed down over 50 years. 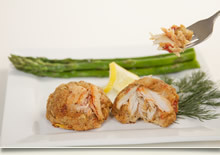 It is a delicious blend of jumbo lump blue crab with our secret blend of spices, handmade and packed in our U. S. plant. Available in 3 oz. and 4 oz. ounce portions. For best results, we recommend the product be sautéed, but it can also be deep-fried or baked. 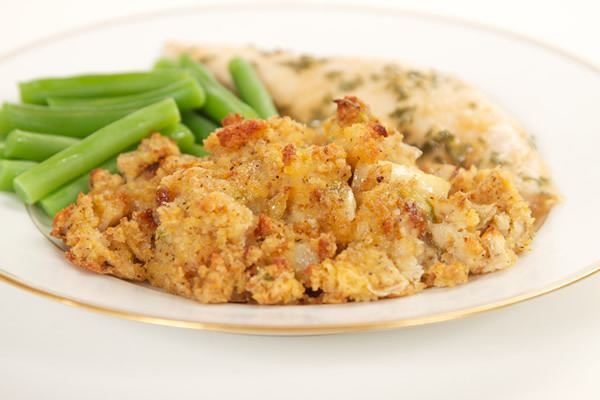 A delicate flounder fillet is topped with our blue crabmeat stuffing and then wrapped with an additional fillet for added flavor and eye appeal. 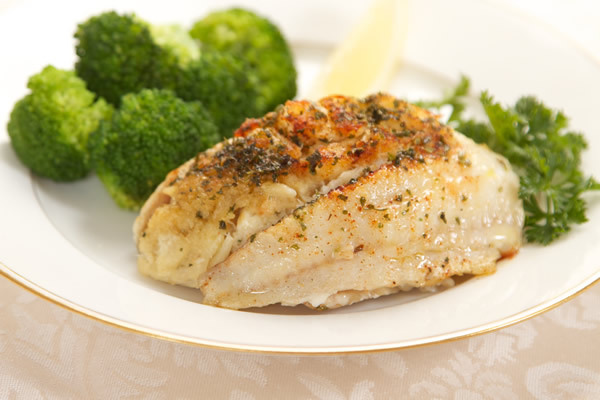 The stuffed flounder is available in four, six, and ten ounce portions. The stuffed flounder is to be oven baked. For best results add butter to barely cover the bottom of the baking dish before baking in order to keep the stuffed flounder from drying out. 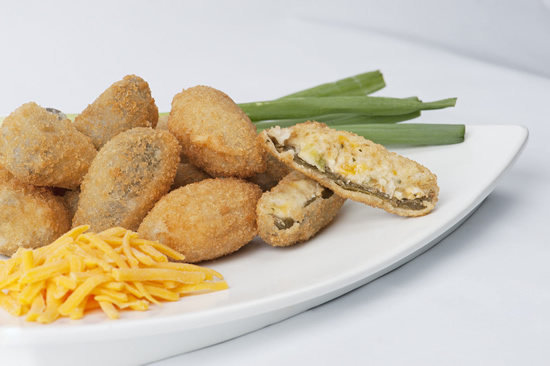 Cheese stuffed pepper-We take a tender mild jalapeno pepper half and hand fill it with a unique blend of mozzarella and cheddar cheeses which is then folded into a blend of fresh herbs, spices, eggs, mayonnaise, and toasted bread crumbs. 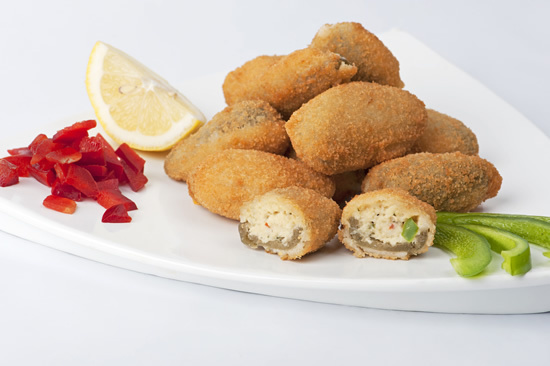 The stuffed pepper is then breaded with a special blend of bread crumbs to form a rich brown crisp coating for fry only. We take a tender mild jalapeno pepper half and hand-fill it with a unique blend of crabmeat, fresh herbs, spices, eggs, mayonnaise and toasted bread crumbs. 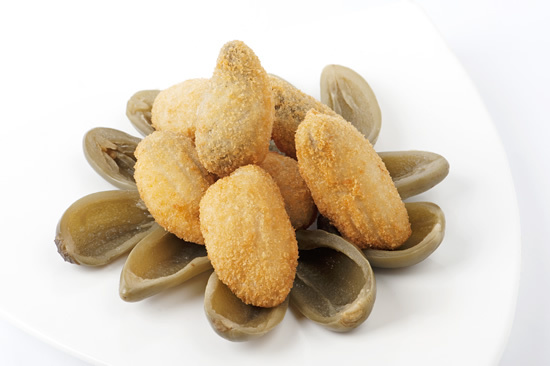 The stuffed pepper is then breaded with a special blend of bread crumbs to form a rich brown crisp coating for fry only. 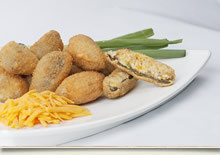 We take a tender mild jalapeno pepper half and hand-fill it with a unique blend of mozzarella and cheddar cheeses, crabmeat fresh herbs, spices, eggs, mayonnaise and toasted bread crumbs. 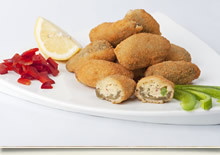 The stuffed pepper is then breaded with a special blend of bread crumbs to form a rich brown crisp coating. It is a truly super value and one of a kind! It can be served on a sampler platter or as an appetizer. This product is fry only. Our Caribbean blend of herbs, spices, sweet conch meat, cornmeal and roasted red bell peppers. It is great product for your own portion control as it can be prepared for any size for your buffet, appetizers, and platters. This product is fry only. Available in 1 oz., 2 oz., and 3 oz. 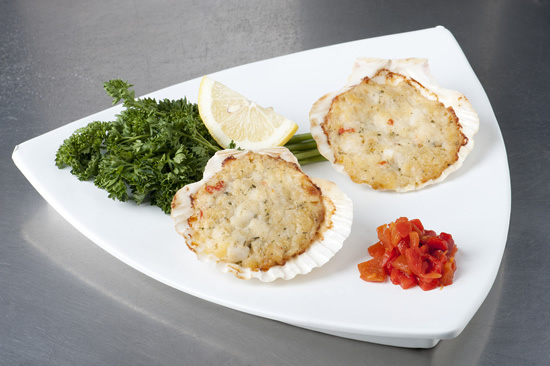 portions,A natural sea shell is hand stuffed with bay scallops, roasted red bell peppers, onions, and breadcrumbs, and then smothered with Mozzarella cheese. This item is great for buffets, seafood platters, or main dishes. From an old southern recipe handed down for over 100 years, a delicious blend of celery, onions, crispy corn bread, toasted white bread and chopped hard boiled eggs. It is flavored with a rich chicken broth and southern spices and bound together with savory vegetable oil and whole eggs. It is then ready to be baked to a golden brown and is great with roasted turkey, baked or fried chicken, roast pork, pork chops, ham or roast beef.